The day after they played a knock your socks off concert in Newark, DE, and just after they led a fiddle workshop in Oxford, PA, for seven enthusiastic fiddlers, one enthusiastic banjoist, and one totally outclassed mandolinist (me! ), Howard Rains and Tricia Spencer were gracious enough to spend some time with the WVUD microphones. We had a lot of fun talking with each other–and Tricia’s laugh is infectious! We talked about their being Texas (Howard) and Kansas (Tricia) fiddlers and about the tunes they like to play. Keeping old tunes alive and understanding how they’ve changed over time is very important to both of them. How did some of those Appalachian tunes make it out to Texas and Kansas? We talked about the “dance fiddle” tradition and the “contest fiddle” tradition which is now more common in places like Texas, Kansas, and Oklahoma. They had some really interesting things to say about how tunes and traditions move around and about how, if you play the old fiddle tunes, you’re keeping the memory of those old fiddlers alive. And you’ll love the story they tell about Tricia’s grandmother’s guitar. 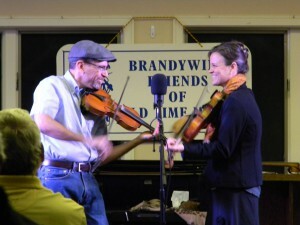 During the interview, they played three twin fiddle tunes for us that may well end up on their next CD, Spencer and Rains: The Old Texas Fiddle Volume II–tentatively subtitled “Weird Tunes of Old Texas.” And the three tunes they played for us were just that–weird and wonderful! We also played their version of “Say Darlin’ Say,” from their CD The Old Man and the Old Woman. As Howard says at their website, “I sez to Tricia, ‘Everybody does that song!’ So she sez to me, ‘Then let’s do it our own way. '” I’m glad they did. I love how Tricia introduces the vocal harmony. That’s enough talk. Listen to the interview linked below, and get your hands on some of their music! (Recorded live 10/11/14; originally aired 11/11/14; host: Mandorichard), 31:36, 30.3 MB. 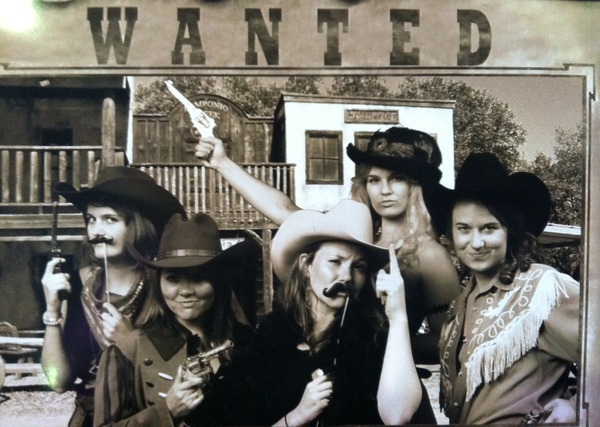 Della Mae is one of the most innovative and interesting bands in bluegrass today. 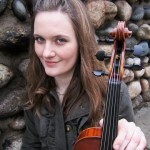 We were lucky enough to catch up with the band’s fiddler, Kimber Ludiker, backstage at the Delaware Valley Bluegrass Festival on August 30, 2013. Kimber tells us the story of how Della Mae, a powerful all-woman bluegrass band, was founded. She also speaks about her 5-string fiddle, her early life attending — and eventually winning — fiddle contests, and Della Mae’s 6-week trip to central Asia on a State Department tour. 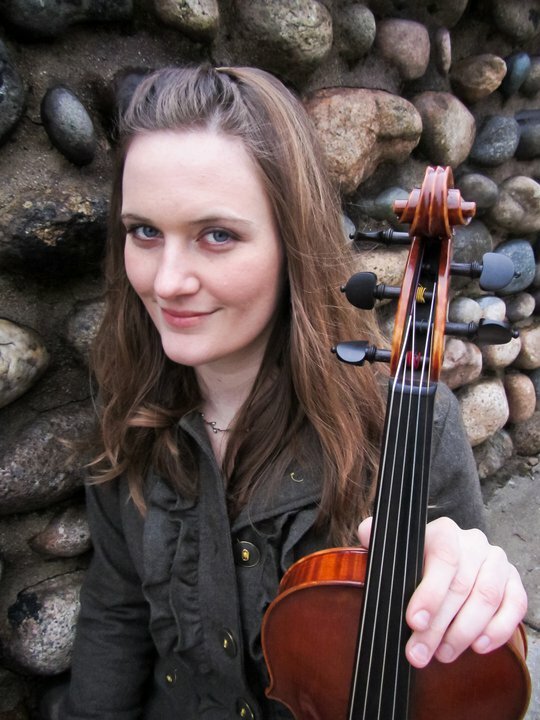 Kimber comes from a family of fiddlers and contest winners and is comfortable playing in a lot of different styles. She brings a ton of energy to any project with which she is involved. Whether she is playing a contest tune, a bluegrass song, an old fiddle tune, or a new improvisation, her fiddle playing is very emotive. You can hear her playing expressive long phrases that complement a vocalist; you can hear her play solos or duets with a driven energy that makes you sit up and take notice. Interview with Kimber Ludiker (Recorded 8/30/13; original broadcast date: 10/29/13; host: Mandorichard). 25:31, 24.5 MB. 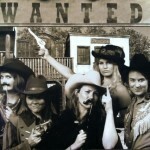 Note: the version uploaded here contains excerpts from the Della Mae tracks used in the broadcast. We may upload other snippets of the interview that were a lot of fun, but were trimmed from the broadcast version. 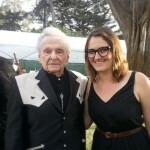 Ralph Stanley (left) poses with Kimber Ludiker.